Randy Houser today announces that along with the launch of his highly-anticipated new full-length album, Magnolia, the singer will release a feature narrative film of the same name which embodies the sentiment of the album’s lyrics. The album, set to be released on January 11th, draws its name from the “Magnolia State” which inspired the homegrown, organic sound Houser has spent the last two years cultivating. The film will feature several live performances by Houser himself, including the lead single off the album, “What Whiskey Does,” which is currently Top 40 and climbing. See the trailer for Magnolia here. 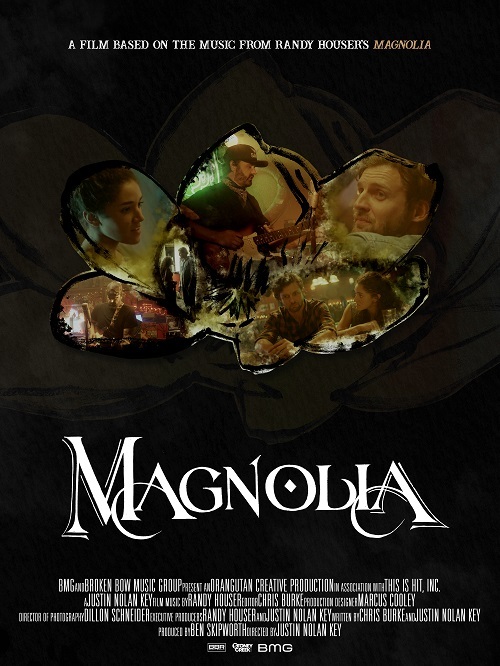 Magnolia, (the film) is set in Houser’s home state of Mississippi and follows two characters (Ana and Noah) in the midst of an intense relationship, marred by their personal lives. Centered around a small group of oil rig workers, the visual representation of the album mirrors the blue-collar sentiments of Houser’s Magnolia lyrics as the small Gulf Coast town provides the perfect backdrop to highlight his rootsy melodies and swampy guitar licks. In the film, Houser plays a local singer at the town dive, performing several songs off the album throughout the film. After garnering millions of sales, four #1 hits, countless sold out shows, a slew of national television appearances and several award nominations, Houser, feeling uninspired, opted to slow things down and set up camp in his good buddy and co-producer Gattis’ studio in East Nashville to recalibrate and rediscover his passion. He spent nearly two years fully invested in his songwriting which resulted with Magnolia and a new sound that is un-polished yet authentically Houser. Houser’s fingerprints can be found on every inch of the project, having co-wrote every song on the album (and playing lead guitar on many of the songs) and serving as executive producer for the film. Directed by Justin Nolan Key, an established music video and documentary director who has worked with Taylor Swift, Maren Morris and the Country Music Association, the film was authentically shot in the Gulf Coast of Mississippi.